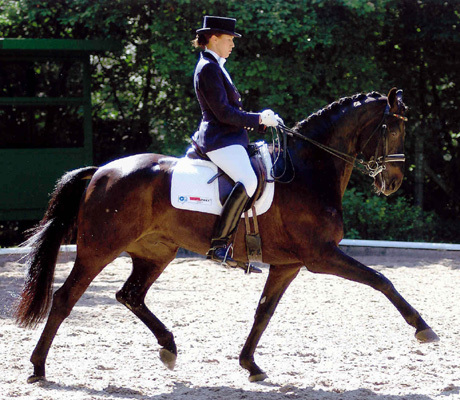 Are you dreaming of your perfect dressage horse? in Europe over the past 30 years. to find the perfect horse for you. but a score of professionals. we will find the horse - guaranteed. 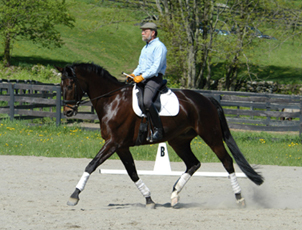 Finding a horse with the athletic ability that will be competitive can be challenging enough. 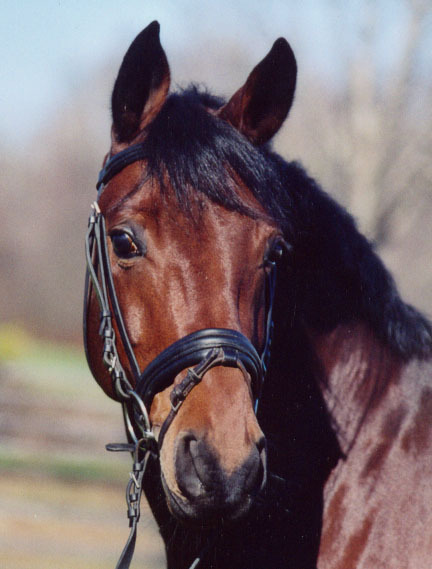 If a parent is buying a horse for a daughter, the temperament of the horse becomes a very important consideration. 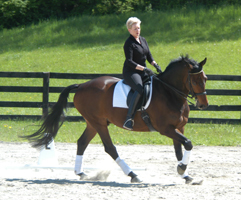 In addition, Sara had turned her focus to dressage and we wanted a horse with the right conformation and training to be a successful Dressage horse. Faced with the realization that it was time for our daughter Sara to move on to a new horse, we contemplated the new search with dread. Where were we going to find a horse that met all expectations? 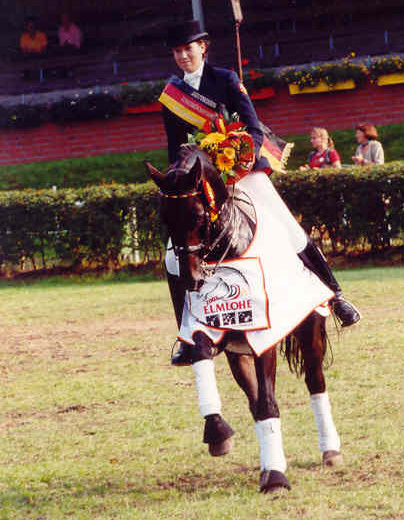 When I first mentioned the possibility of looking in Germany for a horse to anyone, the almost universal response was, "Aren't there good horses here in the US?" The answer to that is "Of course there are." There was one in Florida, one in Texas, one in California, one in Canada, one in Illinois, etc. We simply didn't have the time to travel all over the country to find a horse. 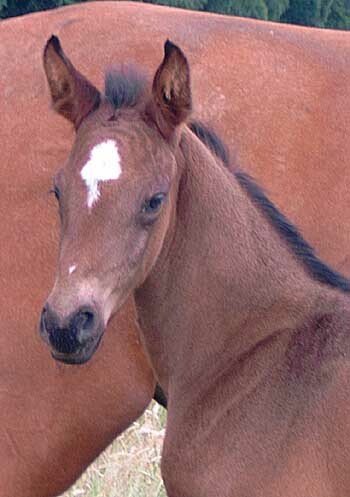 Looking at horses is an enormously time consuming process even when you are searching locally. We needed to expedite the process. 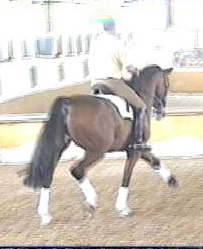 Besides, we figured there must be a reason the Germans do so well in dressage. 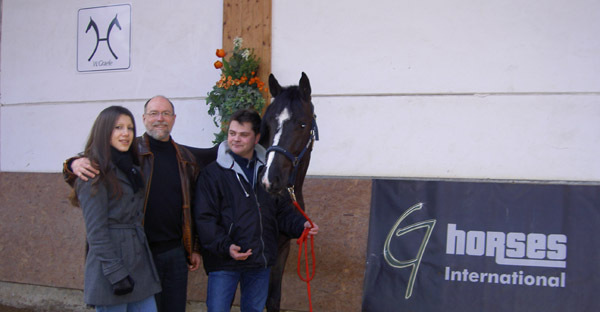 Ron was able to contact Wolfgang, his partner in Germany, about a month before our visit and give him specifics on what we were looking for in terms of size, temperament and price. We planned a five day trip in February. 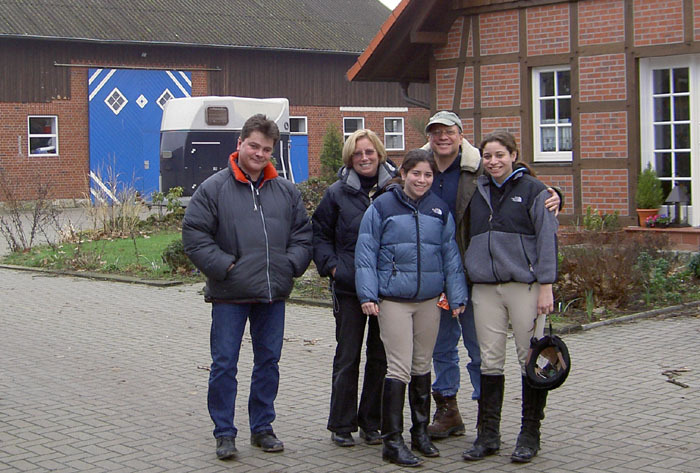 While Wolfgang was searching the various farmers around the area of Germany that is known as the breeding Mecca, Ron worked with Sara. He determined what type of rider she was and worked with her on the horse she owned at the time. By the time we left for Germany he had a very good sense of what she needed in a horse. 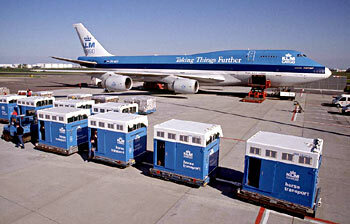 As we prepared for the trip, several people made a point of telling me to beware of the European horse shopping trip. 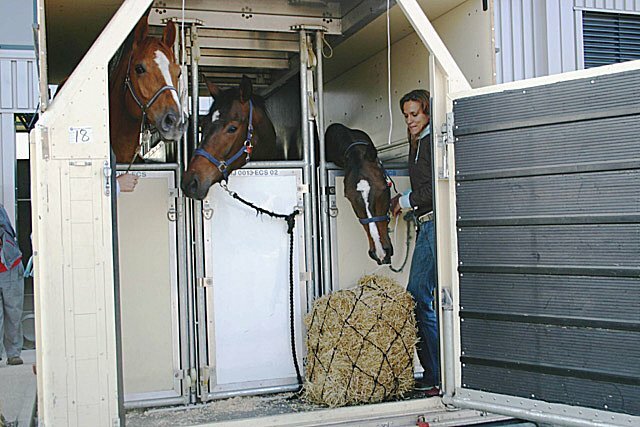 "When they see an American coming..." "What if the horse doesn't work out, you will have to ship it back..." "It is a huge hassle getting a horse here..." Ron alleviated these concerns for us. 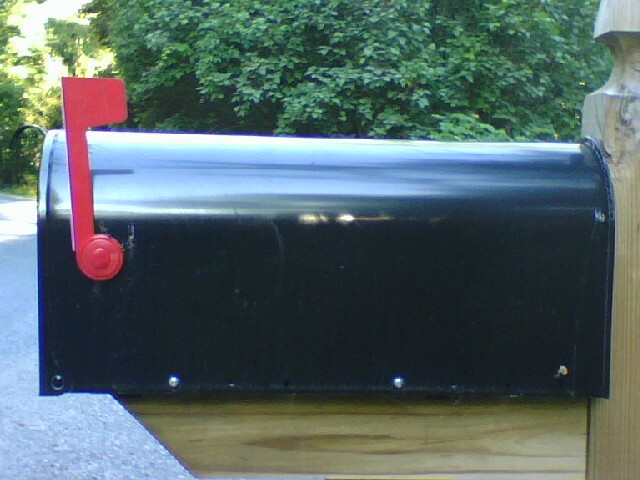 Prices are negotiated prior to the client's arrival. If the horse does not work out, he will credit the cost of the horse towards another. Let's face it, anytime someone buys a horse caveat emptor is the rule. 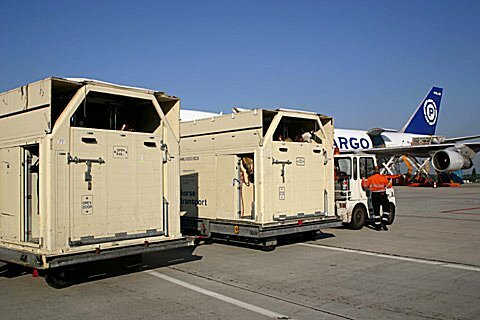 We protected ourselves with vetting in Germany and also had our vet review x-rays here before the horse was purchased. Ron and Wolfgang also made this happen smoothly because German is their native tongue. When we arrived, we had numerous horses to see. 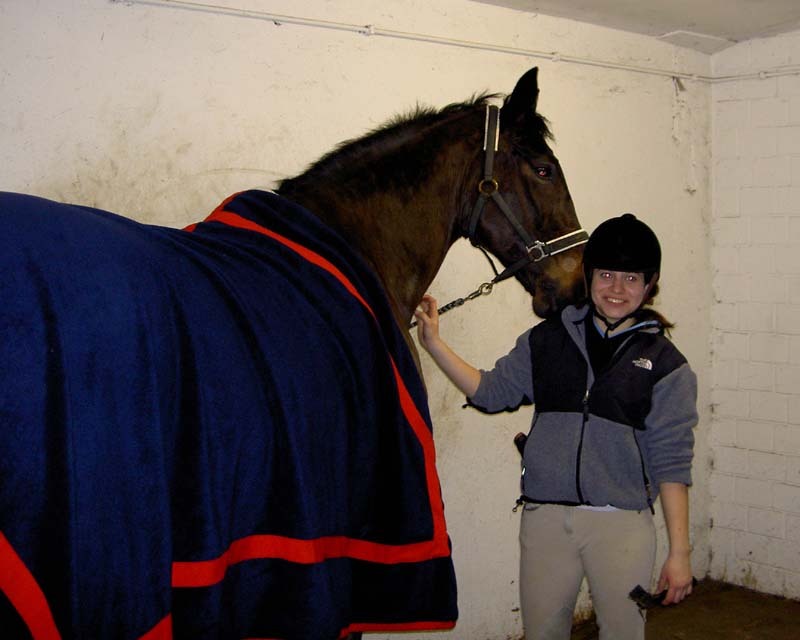 Ron saved us a great deal of time by eliminating many horses as unsuitable for Sara, without her ever getting on. By the third day we were down to four. Halfway through the third day we were down to two. We analyzed those two over and over on video, made a trip back to ride both, and finally decided on Pelano. Five days. Done. Two weeks after we got him we had him out showing. Yes, I think we found the right temperament. But more important, what I think we found is the perfect match. We love to watch them move together so harmoniously. Apparently, so do the judges. 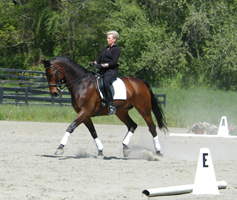 Every dressage test she has ridden has the comment, "Good Pair" or "Good horse and rider combination" or " Nice Pair". Where this pair goes from here is up to Sara, Pelano, and Ron. For now, we are trying to figure out where to put all the new blue ribbons. 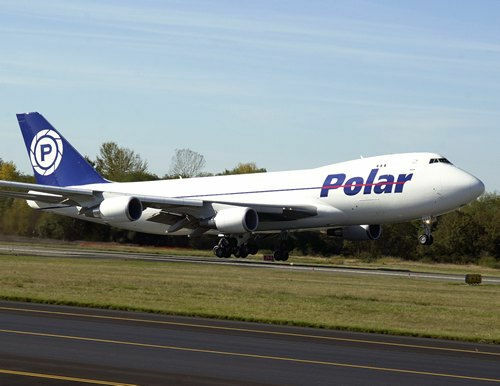 -- Sara Storch traveled to Germany with her family and found Pelano in February 2004. 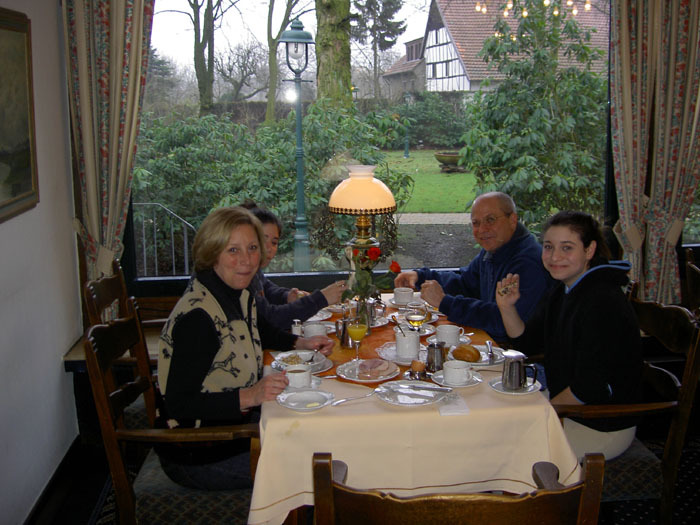 Ron travels to Germany with customers frequently. and available for the best price. provided by the Tim Dutta Corporation.